Canadian Spagnum Peat Moss - Theriault & Hachey Peat Moss Ltd.
At Theriault & Hachey Peat Moss Ltd. we offer a variety of top quality Canadian sphagnum peat moss grades for all your growing needs. From extra fine grade to extra coarse, you’ll find a peat moss designed for any planting stage and soil environment. Extra Fine Grade Peat Moss is designed for seedling beds, plug mediums, hydro seeding and other applications where zero stick/twig contamination is essential. Fine Grade Peat Moss is used for hydro seeding, golf green construction, nursery beds, and other applications where an even granular size and low stick content is required. Medium Grade Peat Moss is designed for greenhouse nurserymen and other professional horticulturists who require a product with a low amount of sticks and nuggets, while maintaining a good fibre structure to allow for high water absorption. 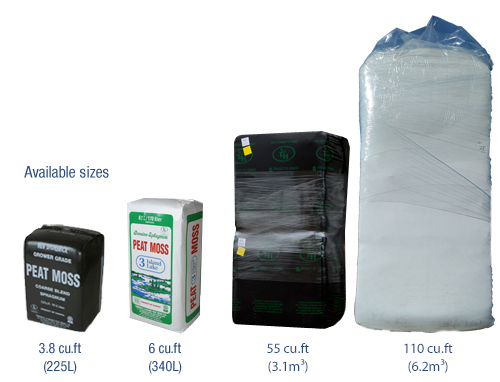 Extra Coarse Grade Peat Moss has the highest air-filled porosity (AFP) for aeration, drainage, and strong root development. It is excellent for maturing plants.